Panasonic reveals new OLED TV for 2017 | What Hi-Fi? Panasonic is working on a new generation of OLED TVs that will aim to offer better than ever black levels, and showed off a prototype at IFA 2016 in Berlin. Panasonic was the first manufacturer to reveal its hand at IFA 2016 and, having launched a new, more affordable 4K Blu-ray player, the Japanese giant also revealed its working on a new generation of OLED TVs. 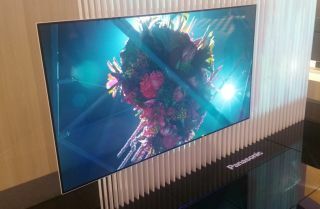 The company is showing a prototype Panasonic OLED flat screen at the show, details of which the company was keeping very close to its chest. Panasonic did confirm that full details would be revealed later this year - "winter" was the time given - ahead of a likely launch at CES 2017. Panasonic also told What Hi-Fi? that the key area of improvement would be black levels and particularly degradations of colour "just above black". A demonstration of the new OLED screen (which isn't a Panasonic panel) against a "conventional OLED" - Panasonic refused to confirm the model to which it was being compared - certainly looked very impressive, seeming to deliver even darker blacks, without losing detail or affecting the punchiness of bright colours. The company promised a step-up in performance over the company's existing Panasonic CZ950 TV, as well, of course, as other OLED TVs on the market. MORE: Which is the best OLED TV?